It’s Pokkén Tournament’s third year as part of the Pokemon World Championships, and for the first time, a non-Japanese player made it to the Grand Finals. Not only did USA’s Jacob Waller make it to the final battle, but he beat out Japan’s Kota Aragaki in the Pokkén Tournament DX Grand Finals at the 2018 Pokemon World Championships in a tense back-and-forth struggle. Screenshot from the Grand Finals stream. Waller, whose Gamertag is ThanksALot–a play on the Pokemon ‘Swalot’–played as Sceptile, but switched to Empoleon midway for a game. Aragaki, whose Gamertag is Tarutaro, exclusively played as Gengar. Waller went home with $6,000 in prize money, and his opponent, Aragaki, took $4,000 as the second place winner. Brendan Hansen, Pokkén Tournament Ambassador and commentator, said Tarutaro is undoubtedly the best Gengar player in the world, and his passion for the Pokemon shines through his skill. Tarutaro actually lost the very first match in the entire tournament, sending him to the loser’s bracket. “[Tarutaro] clawed his way all the way back up–which, I think when we look back, will be a legendary thing–and reset the bracket, just barely to miss it. So ThanksALot just barely came out on top, a huge achievement, but Tarutaro is an incredible player,” Hansen explained. 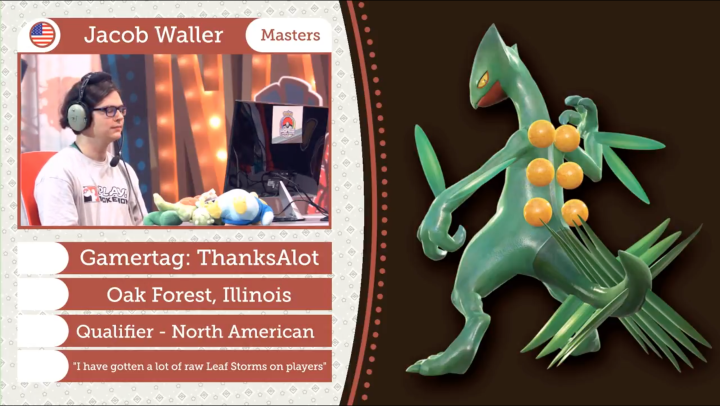 “In the Grand Finals, ThanksALot went down two games, and somehow managed to bring it back and reverse 3-0’d with Sceptile, winning the tournament in the closest fashion,” Hansen explained. ThanksALot said his support Pokemon, Lapras and Snivy, really helped him lock [TaruTaro] in place, since he had trouble hitting Gengar reliably otherwise. Hansen observed that though Sceptile was popular in 2016, since then, the Grass-type Pokemon hasn’t been nearly as common. “ThanksALot was always just playing and grinding and training himself up and now he’s clearly shown that Sceptile is astounding. And he himself is astounding, but the character too. He’s sort of unlocked the secrets of how to play him in a way that makes sense in today’s meta,” Hansen said. I’m so happy, especially since I got to do it with my favorite Pokemon. A Treeko and Prinplup plushy were brought on stage by ThanksALot as support. Treeko, his very first Pokemon, and Prinplup, the evolution of his second starter Pokemon, are both pre-evolutions of the two Pokemon he used to win today’s Grand Finals.